When Ron Dennis made the announcement there was to be a press conference on Thursday morning the Formula 1 world knew exactly what the topic would be. After a long delay and much uncertainty for their drivers, McLaren-Honda as they are now known, announced the return of two-time world champion Fernando Alonso to the Woking team alongside 2009 world champion Jenson Button. With a possible exit from the sport, the Formula 1 world rallied their support for Button who was announced by Ron to have only signed a new two-year contract the night before the announcement. The move, which has seen Kevin Magnussen relegated to the position of Test & Reserve Driver, took so long according to Dennis to avoid any disruption to the end of the season, as well as the possibility of three-car teams for next season. However, Ron Dennis who returned to the forefront of the team following the departure of Lewis Hamilton and the release of former Team Principal Martin Whitmarsh was un-apologetic for the delay. “I know that the media, fans and other people – sponsors, etc – put on every bit of pressure they could for a decision,” he said. “But that decision sits with me and I take the consequences of the results in 2015. No one is going to cut me any slack at all if the decision is wrong. 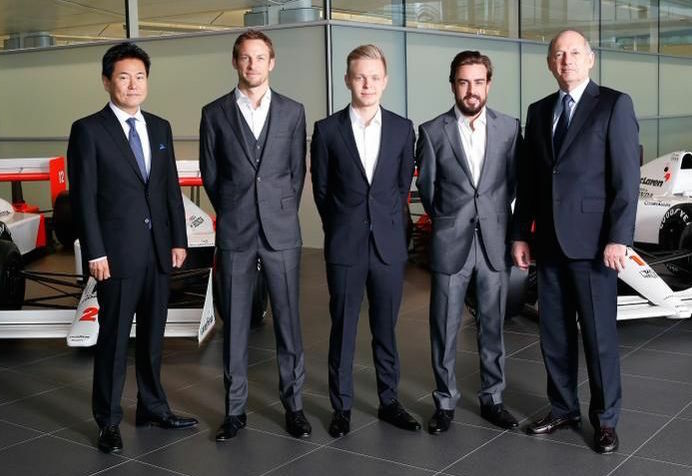 McLaren-Honda announce their driver line-up for the 2015 Formula 1 Season. Whilst many were un-sure on the decision McLaren would make and that a former world champion like Jenson Button should be put in such a position, it was almost certain Fernando Alonso would make a return to the Woking outfit. It is believed after the fireworks between the two Mercedes at the Belgian Grand Prix there may be a seat available for Fernando who has struggled in the un-competitive Ferrari. However, when this was not the case and Red Bull announced the departure of Sebastian Vettel to the Italian team, there was only one logical place for the Spaniard to go – back to his old enemies. With Fernando Alonso almost a definite, many believe that Jenson Button was the right person to stay with the team. When you look at both his and Magnussen’s season, Jenson doubled Kevin’s points with Jenson finishing the season in eighth, compared to eleventh for the Dane. Whilst some may see this as a unfair comparison considering it was K-Mag’s first season in F1, look at what was accomplished by Lewis Hamilton in his first season up against the two-time champion Alonso. Jenson out-raced Kevin 14-3 and narrowly out-qualified him too. 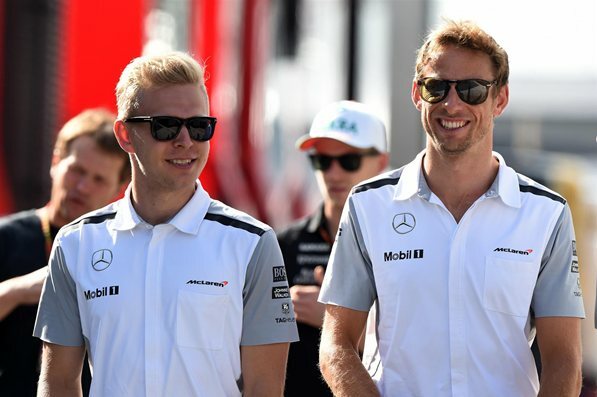 Kevin Magnussen and Jenson Button, drivers for McLaren in the 2014 Formula 1 Season. However Kevin did show his skill and his made himself known to the F1 paddock with his podium at the opening race of season. With K-Mag in the reserve driver role and young Stoffel Vandoorne who has been impressive in the junior formulas, McLaren is definitely looking strong past 2016. 2015 is an important year for McLaren and for Formula 1 as Honda returns to the sport as an engine supplier to the British team. Honda and McLaren have a strong relationship which heralds back to the days of Alain Prost and Ayrton Senna, where both drivers won world titles and the team won constructors titles in a relationship which saw them dominate the sport. 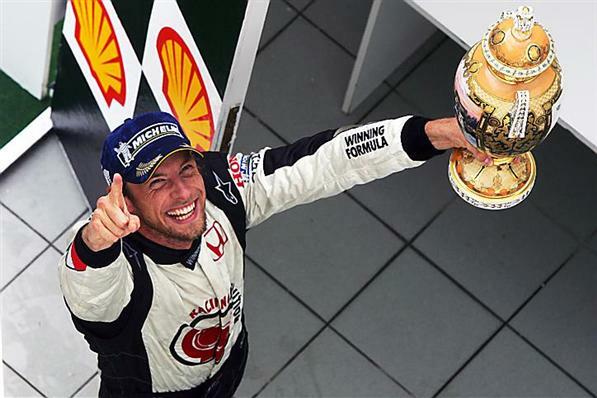 Jenson Button has a long relationship with the Japanese giant from when he was a driver for their factory F1 team, winning his first race with the team at the 2006 Hungarian Grand Prix. When you link this to Jenson’s love for Japan and the culture through his fiancé Jessica Michibata, he has a large following in Japan and will be a great ambassador for the brand and the team. This will be apparent in the countless media and sponsorship commitments that come with being a McLaren driver. McLaren are known to give their drivers handfuls of appearances and meetings to fit into their season – one of the reasons which left Lewis Hamilton knocking on Mercedes’ door. Jenson Button has been called a great ambassador for the sport by countless figures within F1, no one more loud than former team boss and BBC pundit, Eddie Jordan. It is in the way Button carries himself even in the toughest of situations that has given him this title, not to mention the work he does promoting the sport in such media events. No one relishes the corporate affairs, the signings and the driving displays like Jenson Button and with new sponsorship and media events opening for Honda and McLaren in Japan, there’s no doubt that Jenson will play a huge part and could have been a factor in McLaren’s decision to keep him in the team. Jenson Button celebrates winning the 2006 Hungarian Grand Prix with the Honda F1 Team. Probably one of the biggest factors that kept Jenson Button in Formula 1 and at the Woking outfit was McLaren’s need for a strong team moving forward. Since the rule changes of 2009 where Jenson defined his career winning the title with Brawn, McLaren have been on a downward spiral, with glimmers of success. The Mercedes factory seems to be stronger by the day after winning both constructors and world titles this season with drivers Lewis Hamilton and Nico Rosberg. Although Ferrari have been in a similar situation as McLaren, they have added star power with new recruit and four-time world champion Sebastian Vettel with 2007 world champion Kimi Raikkonen. That’s not forgetting Daniel Ricciardo in the Red Bull, the only other person to win an F1 race in 2014 that wasn’t a Mercedes, as well as the resurgence of the Williams. It is important for McLaren to have a strong team as they look to start their renewed relationship with Honda. Only time will tell where the Honda power unit fits against the Mercedes and Renaults and if McLaren can build a reliable package around it to move McLaren back up the order and back in a winning position. However with Fernando Alonso and Jenson Button, which many are arguing are the strongest partnership on the grid, they are a good way to achieving that goal. Can London and the UK be a Credible Host for WWE WrestleMania?